The Undrafted Free Agent: Where is Mike Wilkinson Now? Where is Mike Wilkinson Now? Each new college basketball season introduces the nation to new talents destined for NBA superstardom. Nightly, or at least it appears, Kansas State's Michael Beasley is throwing up monster numbers, making it easy to forget the seniors who are seemingly entering their second decade on campus. Considering the circumstances, it is difficult to appreciate a player like Mike Wilkinson, who was redshirted his first year on campus. A native of Blue Mound, Wisconsin, Wilkinson attended Wisconsin Heights High School. With averages of 28.6 points and 12.1 rebounds, he led his squad to a 19-4 record and a league title. In the process, Wilkinson was named Wisconsin's Mr. Basketball and Wisconsin Player of the Year by the Wisconsin State Journal. His play earned him a scholarship to the University of Wisconsin. Unlike his more talented counterparts, Wilkinson did not see the floor during his first season. Instead, he was redshirted and allowed to develop his game. The following season, Wilkinson, as a redshirt freshman, led the Badgers in rebounding (5.3 per game) and scored 9.3 points per game as a backup. His four double-doubles were the most for a Wisconsin freshman since 1993-1994. Wilkinson played a key role in an upset against Marquette, scoring 16 points and grabbing 12 rebounds. Wilkinson's sophomore season saw him crack the starting lineup. He finished fifth in the Big Ten in rebounding with 6.8 per game. Additionally, Wilkinson upped his scoring average to 10.3 points. The Badgers made it to the Sweet Sixteen before being defeated by Kentucky. 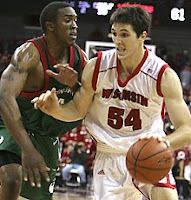 In his junior year, Wilkinson averaged 13.1 points and 6.8 rebounds, helping Wisconsin finish second in the Big Ten. His play earned him a spot on the All-Big Ten Second Team. In addition, Wilkinson was named to the Big Ten All-Tournament team as Wisconsin won the Big Ten Tournament for the first time. The success did not carry over; the Badgers lost in the second round of the NCAA Tournament. Wilkinson finished among the top ten in Wisconsin's history in 11 career categories, including sixth on the all-time scoring list (1,532 points), third in career rebounds (856) and first in offensive rebounds (311). He played in a school-record 130 games, never missing a game. Wilkinson was just the second player in Wisconsin history to finish with at least 1,500 career points and 800 career rebounds. Heading into the 2005 NBA Draft, Wilkinson was expected to either be drafted late in the second round or go undrafted. After pre-draft camps and workouts with Golden State, Milwaukee, Dallas, and Memphis, he was considered a nice all-around player with face-up abilities. However, some scouts worried Wilkinson lacked one skill that would truly excel at the NBA level. As a result, Wilkinson went undrafted. During the summer of 2005, Wilkinson signed with the Utah Jazz to play in the Rocky Mountain Revue, an NBA summer league. He played modest minutes and was unable to catch on with an NBA team. At that point, he was faced with a decision. Wilkinson could have entered the NBDL, which offers moderate NBA attention with little compensation. On the other hand, Wilkinson could have left for Europe and the comparatively lucrative money. Wilkinson, who also added that he needed to support his wife, said, "I'd rather go overseas and play over there and just take a year and get better." For the 2005-2006 season, Wilkinson joined the Greek team Aris Thessalaniki. They, behind Wilkinson's averages of 11.2 points and 6.7 rebounds in ULEB Cup play, finished first in their pool. Aris then advanced to the finals before losing to Moscow Dynamo. In Greek League games, Wilkinson continued his strong play, earning a Greek League All-Star nomination. The following year, Wilkinson returned to Aris, having been upgraded to the Euroleague. Aris went on to finish just 7-13, though Wilkinson would average 12.3 points and 5.9 rebounds against the higher competition. For the second straight season, he was named a Greek League All-Star. In the offseason, Wilkinson was awarded Macedonian citizenship, making him a Bosman player. Being a Bosman, Wilkinson is not counted against his team's limit on American-born players, thus increasing his free agent value (such quotas are commonplace in European leagues). In the summer of 2007, Wilkinson played for the Macedonian national team. Considered among the top free agents in Europe this past summer, Wilkinson signed a two-year contract with Khimki, a Russian team featuring former NBA players Daniel Ewing, Pat Burke, and Maciej Lampe. Wilkinson is currently averaging 8.6 points and 4.4 rebounds in 23 minutes for the team. Khimki trails only Russian superpower CSKA in Superleague play with a 17-2 record. What exactly are his chances at making it back to the United States and the NBA? Well, Wilkinson has the ability to make an NBA roster. However, it is unlikely that an NBA contract would match the money he is earning in Europe. A seven figure deal is likely for Wilkinson, assuming he continues to develop his game. Looking back on Mike Wilkinson's past, there is little doubt he will continue to improve. Wilkinson has done well for one of basketball's undrafted free agents. Labels: NCAA Basketball, Where is he now? The fact that Mike is not playing in the NBA, shows whats wrong with the NBA. Why would the want a hard working soft spoken team player? Ron Crimson was the only player on the high school roster to not get in a game. He couldn't argue with the decision, because he sucked. Needless to say, yet stated anyway, when he entered the NBA draft following his sophomore season in college, he went undrafted. Now, Ron Crimson is the Undrafted Free Agent. Interested in informing the Undrafted Free Agent of his mistakes, advertisement opportunities, or a scoop on the latest sports scandal? (You can guess which is more likely.) Well, email him at undraftedfreeagent [at] gmail.com. There's nothing here; I just needed to fill some space. Space eater! Space eater! Space eater! Space eater! Space eater! Space eater! Space eater! Space eater! Space eater! I also needed to balance it out a bit.